Lankan born Raj Rajaratnam, the hedge-fund tycoon and Galleon Group LLC co-founder at the center of a U.S. insider-trading crackdown, was found guilty of all 14 counts against him in the largest illegal stock-tipping case in a generation. A jury of eight women and four men in Manhattan returned its verdict today after hearing evidence that Rajaratnam, 53, engaged in a seven-year conspiracy to trade on inside information from corporate executives, bankers, consultants, traders and directors of public companies including Goldman Sachs Group Inc. (GS) He gained $63.8 million, prosecutors said. The trial came as Manhattan U.S. Attorney Preet Bharara promised to crack down on “rampant” illegal trading on Wall Street. 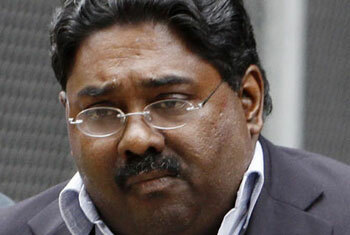 Rajaratnam was convicted on five counts of conspiracy and nine counts of securities fraud. Conspiracy carries a maximum sentence of five years; securities fraud can bring 20 years in prison. Prosecutors today said he faces between 15 1/2 and 19 1/2 years in prison at his July 29 sentencing. Rajaratnam’s lawyer said he will appeal the verdict. “He joins the pantheon of Ivan Boesky and Gordon Gekko,” said Peter Henning, a professor at Wayne State University Law School in Detroit, citing both the real-life stock trader who was jailed after pleading guilty to conspiracy in 1987 and the fictional “Wall Street” film character who came to symbolize the financial scandals of the 1980s. “It is a defining case,” Henning, a former federal prosecutor, said before the verdict was handed down. As Rajaratnam entered the courtroom today before the verdict was read, he tugged at his white shirt collar. One of his lawyers, John Dowd, patted him on the shoulder as they walked in. After the verdict, Rajaratnam was allowed to remain free on bail with electronic monitoring pending sentencing. Galleon was among the 10 largest hedge funds in the world in the early years of the last decade. It managed $7 billion at its peak in 2008. Rajaratnam’s net worth of $1.3 billion made him the 559th richest person in the world, Forbes Magazine said in 2009. Before his arrest on Oct. 16, 2009, Rajaratnam had claimed that Galleon analysts had an advantage over rivals because most were trained as engineers and all focused their energies exclusively on research. At the trial, his lawyers said his trades were based on Galleon research. “They don’t get blindsided by the marketing hype,” Rajaratnam said of his analysts in “The New Investment Superstars: 13 Great Investors and Their Strategies for Superior Returns,” by Lois Peltz. Adam Smith, a former Galleon trader, testified at the trial that the New York-based hedge fund gained its advantage through other means. Rajaratnam emphasized “getting the number” -- or learning revenue figures before they became public -- from insiders at Intel Corp. (INTC), Intersil Corp. and other publicly traded companies, he said. The case was the first one focused exclusively on insider trading in which prosecutors wiretapped their targets’ telephone conversations, a tactic used in organized crime investigations. Jurors heard more than 40 recordings of Rajaratnam, in some of which he can be heard gathering secrets from his sources. Rajaratnam used inside information to trade ahead of public announcements about earnings, forecasts, mergers and spinoffs involving more than a dozen companies, according to the evidence at the trial. Among them were Santa Clara, California-based Intel, New York-based Goldman Sachs, Google Inc., ATI Technologies Inc., Akamai Technologies Inc. and Hilton Hotels Corp. Prosecutors said Rajaratnam’s sources included Rajat Gupta, who until last year was a director at Goldman Sachs, and Kamal Ahmed, a Morgan Stanley investment banker who prosecutors said passed tips through Smith. Both deny wrongdoing, and neither has been criminally charged. Born in Sri Lanka’s capital, Colombo, Rajaratnam was educated there at St. Thomas’ Preparatory School before leaving for England, where he studied engineering at the University of Sussex. He came to the U.S. to get his master’s of business administration, graduating from the University of Pennsylvania’s Wharton School in 1983. Two of his Wharton classmates -- Anil Kumar, who became a partner at McKinsey & Co., and Rajiv Goel, who was a managing director at Intel -- testified against him at the trial, telling jurors how their relationships began at the school and how they turned to crime. Both pleaded guilty and testified for prosecutors. Rajaratnam’s first job after graduation was at Chase Manhattan Bank, where he was a lending officer in the group that made loans to high-tech companies. In 1985, he joined Needham & Co., a New York-based investment bank that specialized in technology and health-care companies. He started as an analyst covering the electronics industry and rose through the ranks, becoming head of research in 1987, chief operating officer in 1989 and president in 1991. A year later, at 34, Rajaratnam started a fund, Needham Emerging Growth Partners LP, according to Galleon’s marketing documents. Rajaratnam’s case was the most prominent amid a widespread U.S. crackdown on insider trading. In New York, the Galleon probe and related cases have led to more than 40 arrests since 2009 and guilty pleas from about 30 of the accused, including Chiesi. A related case against former Galleon trader Zvi Goffer is scheduled for trial this month. Among others charged are executives affiliated with Primary Global Research LLC, a Mountain View, California-based networking firm that links investors with industry experts who work for public companies. The case is U.S. v. Rajaratnam, 1:09-cr-01184, U.S. District Court, Southern District of New York (Manhattan).